When we bought this house in 2009 we brought three Peonies with us. There were already three here. Since then, I have added several others until I have nearly a dozen. All of them I bought from Adelmans, which also has a lovely display garden, but much smaller than Schreiners. The two farms are only about a mile from each other up in Keizer. My very first acquisition was Bartzilla. I had been lusting after a Yellow Peony, but was completely intimidated by the three digit price tag. But I rethought my frugality when I realized my coworkers had given me a very nice gift to be spent on the plant of my choice as a retirement gift. So I bit the bullet and bought Bartzilla. It is now huge and has dozens of 12 inch flowers this year. I have bought one or two Peonies each year since then. My most recent was this lovely pale pink single Peony, which is still in a pot. I have the perfect spot next to two other lovelies. Next to Bartzilla, I think my favorite is this beautiful Coral Charm. I just love that color. It had been in my eye for several years before I finally got it. Over time, I added a deep magenta one, a dark red one, a pale peachy one, and a white one. Who knows what I will buy next. I would love to have another Itoh hybrid, like Bartzilla…maybe in the rusty range. We will see. More likely, it will be much less expensive than those beauties. I’m still lusting after a Peony with a bomb of petals in the center. What a beautiful collection of peonies! Thanks and thanks for stopping. We really enjoy our peonies and most are quite fragrant. This was a dangerous post for me because I love peonies and I thought I might see one of yours I would then lust after. 🙂 I was the same with Bartzella – wanted a yellow flower badly so paid the high price but since there was a sale, I purchased Sequestered Sunshine, another yellow at the same time. 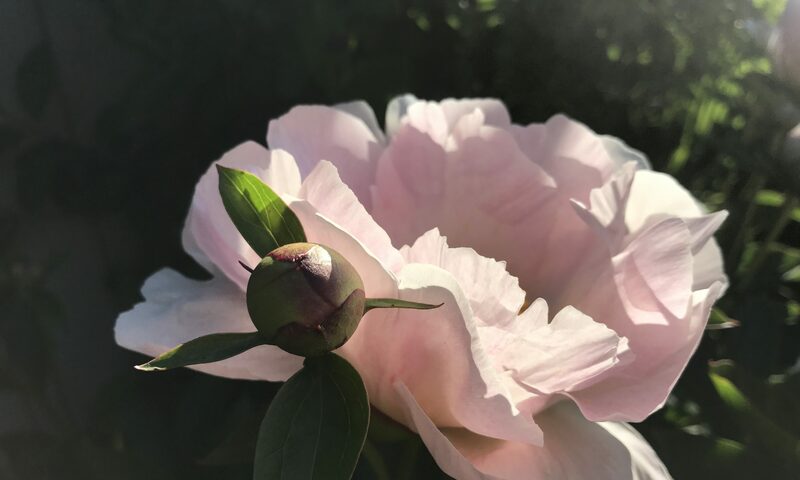 My biggest thrill was digging part of a peony out of the bush where a homestead once stood and discovering it is Festiva Maxima. I couldn’t believe it flowered with barely any light but a tiny white flower emerged and that’s when I saw it under the trees. Thanks for sharing your peony collection and I hope you are able to find another that you really like. Thanks for coming by. Glad I could tempt you. And very glad to hear you share my love of Bartzilla and other peonies. I have not heard of Sequestered Sunshine. I will have to keep a lookout. I did make it to Adelmans Peony Farm after all this last weekend, and came away unscathed. The ones I really wanted that I could afford were all sold out. I’ll have to wait till next year. Hope you are having a great week. Gorgeous! My favourite is the yellow peony (go figure that I’m drawn to the most expensive flower!). Thanks and thanks for coming by. Glad you like my peonies. Bartzilla, the yellow one, is gradually coming down in price. Just to tempt you. I forget how beautiful peony is until someone puts up a picture. These are all just so lovely. Thanks for sharing at the Macro Monday Mixer and for linking back to it. I really appreciate it. Thanks for coming by. Glad you are enjoying the peonies. Thanks for having the blog party. Hello. I come to from Mosaic Monday. I chose yours to read because of the peony. Oh how I love the peach coloroed one. I have six peonies. I purchased three from a catalogue White Flower Farms, a collection of old fashioned peonies. The other three came from an iris farm in our area (northern Colorado). Do you feed your peonies? My grower feeds hers rabbit food, ie. alfala pellets. I have one plant with very faded pinkish leaves. She will bloom, but just does not look healthy. You have a wonderful collection and I am glad that you splurged. Gotta do that sometimes. What a wonderful collection! I never thought much about peonies until we moved to this house and it had some growing in the garden. You might have just encouraged me to expand my garden with more of them! All great beauties and good photographic work, too. Wow, these are all magnificent! I love all peonies. I love peonies that Bartzilla is fantastic. I need to find me some of those for my next flower garden. We’re selling in a year so I’m trying to not add any more plants. This one is tempting! Wow, you have an amazing collection. I love Peonies! I have a few of the Bowl of Beauty and added a peach one last year. It had one bud on it when I bought it, but I planted it in front of a gate and it tipped over and broke off the bud. Didn’t bloom at all this year. : ( I hope to add more of them. Thanks for sharing wit h SYC. What a wonderful collection of peonies! My fave is “Coral Charm”. Thank you for joining us at Floral Friday Fotos, hope to see you contributing again soon.